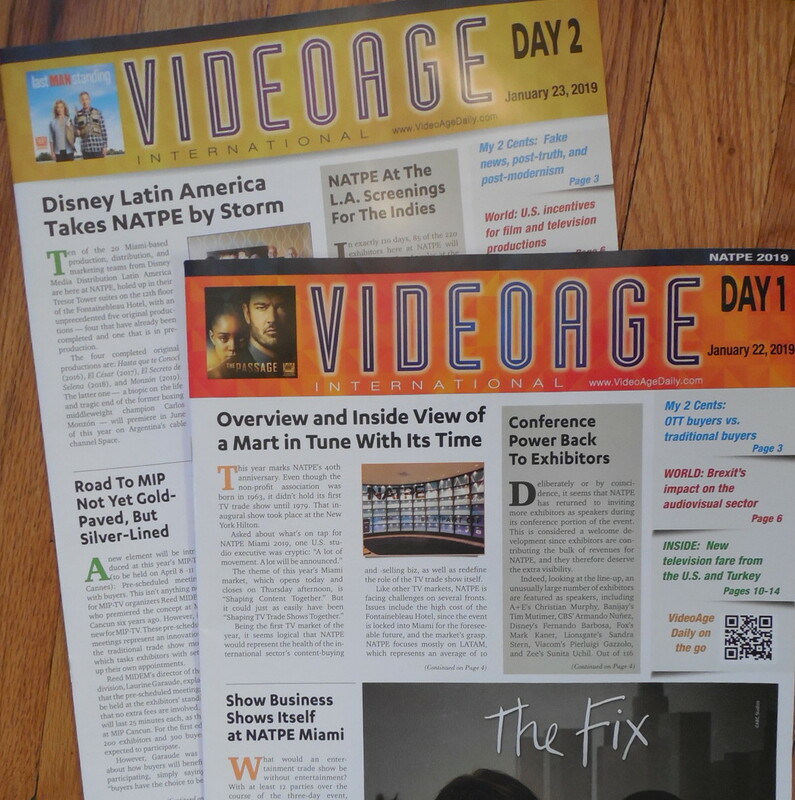 VideoAge’s two daily issues at this year’s NATPE Miami portrayed a broad-spectrum picture, exploring the market’s present challenges, future concerns, and the exhibitors who leveraged the most out of the 40th edition of the market. The Day One Daily (Tuesday, January 22) focused on the market’s business at hand, reporting on the fact that the panelists at a good number of conferences were also exhibitors. 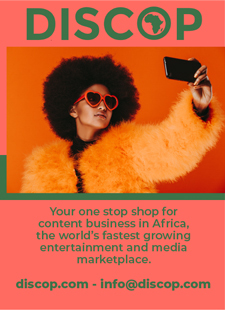 The dailies took notice of several dilemmas facing the market, such as the high costs associated with the market’s venue, its narrow regional scope, and the decreased number of participants. 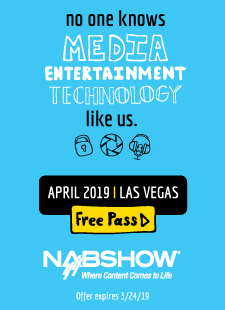 These same issues came up during a NATPE press meeting that took place on the market’s final day (Thursday, January 24), where NATPE CEO JP Bommel was presented with a few suggestions collected from participants and exhibitors alike. Some advice floating around included lengthening the available market floor time, scheduling conference programming beginning on Day Two, and considering further international expansion. At the same press conference, Bommel explained how this year’s Miami market developed along three major planes: On the domestic (U.S.) side, which returned with first-run shows; on the international side, with Japan doubling its presence; and on the digital front, which, as indicated in a VideoAge monthly editorial, is code for Netflix and Amazon. In fact, during a panel conference called “How Wall Street Watches TV,” talk was focused on the surge of OTT platforms successfully heralded by those two streaming giants. Moderated by Lionsgate Entertainment’s James Marsh, a group of Wall Street analysts hardly mentioned broadcast television. One of the panelists, Steven Cahall of RBC Capital Markets, forecasted Netflix, Amazon, Disney, and Apple as the four big companies with the capacity to dominate the global market. Another panelist, Amy Yong of Macquarie Group, said it seemed as though “everyone and their mom were launching an OTT product.” Of course, she added, the question was how to monetize it all. One of the slides used to prompt discussion even asked, “How can traditional media companies protect their business?” Stats prepared by Lionsgate showed that nearly 60 percent of those polled suggested selling their businesses. On the other hand, as Cahall had anticipated earlier in the panel, further mergers and consolidations would take place, causing the bigs to get even bigger. The consensus from buyers and sellers who spoke to VideoAge was that the 2019 market was busy. The elevator lines for the Tresor Towers were equally bustling, but wait times were significantly improved. 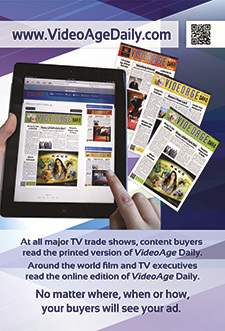 As usual, the market was showered with deal announcements from companies such as All3media, FilmRise, Kew Media, Viacom International Studios, Televisa, and CBSSI, among others, all reported in VideoAge‘s Day Two Daily. 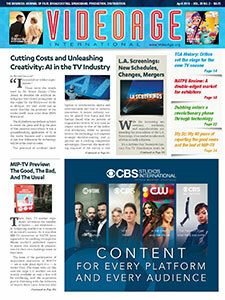 An extended report will be published in VideoAge’s MIP-TV Monthly edition.